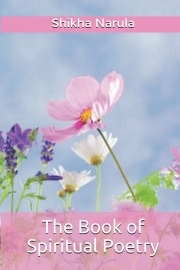 Description of "The Book of Spiritual Poetry"
In this divine little poetry book, Shikha takes us all on a beautiful journey within and helps us light the inner lamp by deepening our faith in God, love and the universe, using her exceptional talent for writing poetry and the realization she gained after studying the various religious scriptures of the world and meditating on Truth for about twenty years. Shikha is a spiritual writer, metaphysical poet, fine artist and author from Mumbai, India. She is an indigo child and is highly intuitive with clairvoyant, claircognizant and clairaudient abilities. She started meditating and studying various religious scriptures of the world at an early age of twelve. She has studied the Taoist philosophy in detail. She also spent some time studying the Buddhist philosophy. Later, she studied The Bible and the teachings of Paramahansa Yogananda. She has been studying the teachings of Satguru Sivaya Subramuniyaswami since 2007, under the guidance of the monks at Kauai’s Hindu Monastery in Hawaii, U.S.A. Reviews of "The Book of Spiritual Poetry"